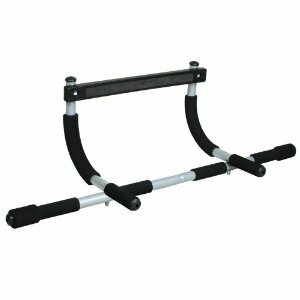 A pull-up is absolutely necessary for a proper bodyweight training routine, and the Iron Gym Total Upper Body Workout Bar is very easy to assemble and attach and remove from a doorway, it causes no damage to the door frame, and it feels very stable when used. You can even travel with it. When I’m traveling, I disassemble it and packed it in the box it comes in. I throw that in my luggage and then assemble it for use in wherever I’m staying. Simple. Effective.